I love finding new recipes to try for dinner. It gets so boring making the same thing week after week. But new dishes have to be fairly easy and not too extravagant otherwise it’s just not fit for a weeknight. Chicken is my all time favorite protein, so any time I can find a new and tasty way to prepare it, I’m all over it. 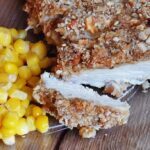 I found this recipe for Honey Mustard Pretzel Chicken over at Cinnamon Spice & Everything Nice. I made just a couple minor changes, like subbing some walnuts for some of the pretzels because I love a nutty flavor. I also used a brown spicy mustard instead of Dijon as I prefer the deeper flavor. 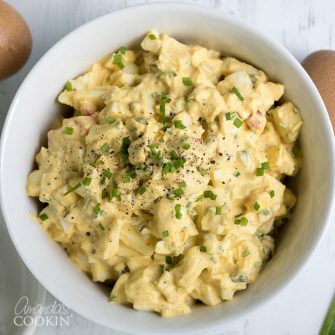 It was truly delicious and has been added to my list of foolproof dinner dishes! It’s pretty straightforward. You’ll mix together pretzels, walnuts and bread crumbs in a food processor. Then you’ll process the dressing ingredients as well. After that it’s just dredge, dip and dip! Bake them up and enjoy. 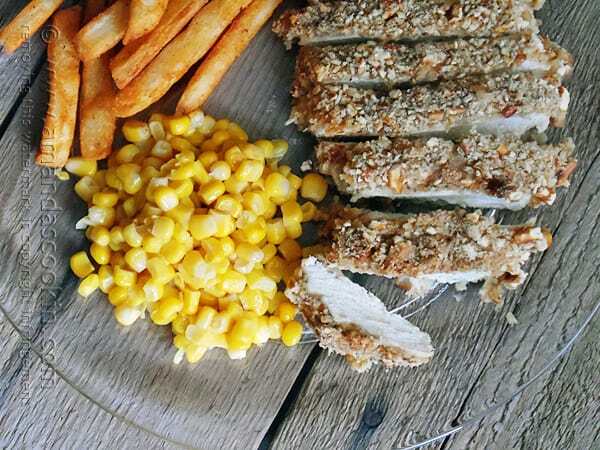 Looking for more chicken dinner ideas? 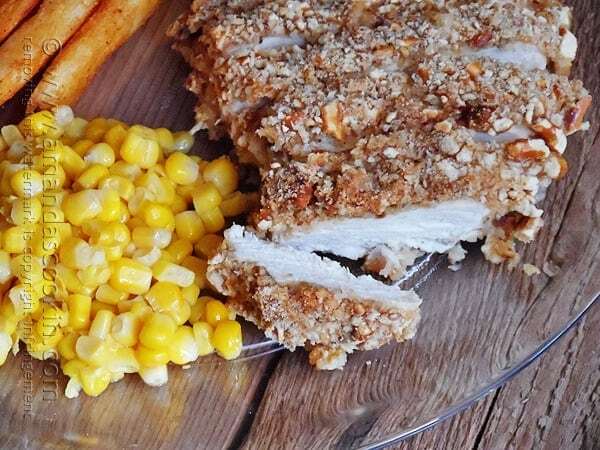 I’ve hand picked a collection of my recipes below, but if you’d like to see more, browse all the chicken dinner recipes here. Preheat the oven to 400° F. Line a large baking sheet with parchment paper. In a food processor pulse the pretzels and walnuts until coarsely ground. 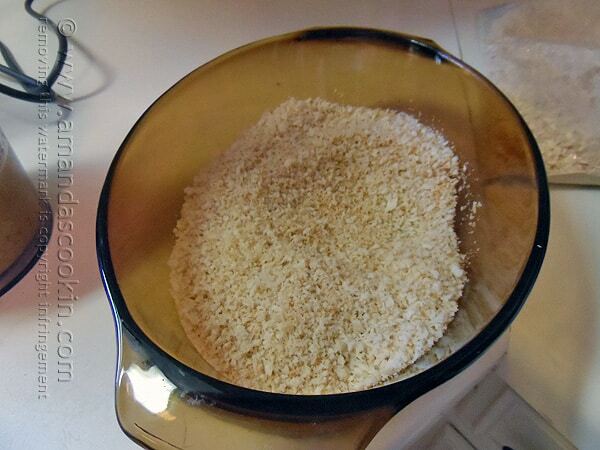 Place in a medium bowl and mix with the panko crumbs. 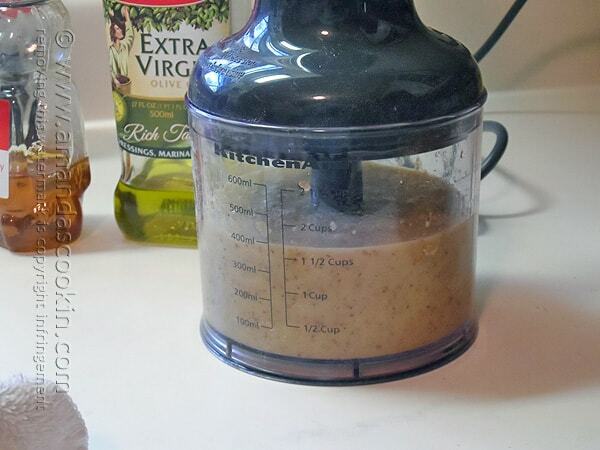 Add the olive oil, mustard, honey, and water to the food processor and pulse until smooth. Season with salt and pepper to taste. Pound the chicken breasts to an even thickness (about 1/2") between two sheets of waxed paper using a meat mallet. Pour half of the dressing into a large shallow dish. Place the flour and half of the pretzel mixture in two more separate shallow dishes. Add additional pretzel crumb mixture as needed. Dredge the chicken in the flour then dip into the dressing, allowing excess to drip off, and finally into the pretzel crumbs. Press gently on breasts to help the coating adhere. Place on prepared baking sheet. Bake 20 - 25 minutes depending on their thickness/size or until cooked through (internal temperature 165 - 174 degrees F.). You asked about the book “Hand held Pies”. I went to Amazon and looked at it and the contents, pictures etc. all in all I liked it so much I bought it. I bought one of the used ones because I have had very good luck with the condition of used cookbooks, especially if they are labeled “good” or above, they really are in most cases just like new! Quite a savings, my book was 9.35 plus 3.99 postage. Then I remembered that I usually have some “Amazon Points” in my account, so that made my book balance a whopping “0” balance due, and I still have points left over! Can’t wait to get the book! Awesome deal Elizabeth! I hadn’t heard of Amazon points, will have to check into that! Crushed pretzels make a fabulous crust…Love it. Thank you for the shout out Katie! This sounds amazing! One of the first dishes I ever made (when I was a little 10 year old girl) was cheez-it chicken. I remember it was similar to this recipe except cheez- its instead of pretzels! This recipe looks and sounds great- thanks, Amanda!